NHTET 2018 application form can be submitted online only on the official website of NHTET at www.thims.gov.in. The last date for receiving the confirmation sheet for the application sheet is 28 February 2018. To fill the NHTET 2018 application form, the candidates can follow the following procedure. First, the applicants have to register themselves on the official website. The candidates have to enter their Name, Gender, Father’s Name, Mother’s Name, Mobile Number, Email-id, Date of Birth, Category and Verification Code. Now the applicants have to click the registration button. Now the candidates will receive a registration number from the server. Now the candidates have to log in to the server using the registration number and date of birth. After login, the candidates have to fill the application form. Now the candidates have to fill the application form by providing their personal details, educational details, professional details (If have) and contact details etc. the candidate not having post-graduation degree in Hospitality, have to fill the details of their experience minimum 2 years in hotel industry after his/her graduation. The candidates have to now make payment of the application fee. The candidates can make payment of the application fee only through demand draft. Demand draft can be made from any approved Bank for the requisite amount of application fee. If the DD sent by the candidates along with the application form does not match the system, will be liable to be rejected. NHTET 2018 application form can be submitted only through online mode on the official website of NHTET at www.thims.gov.in. After making payment of the application fee, the candidates will have to take a printout of the completed form. The duly filled application form along with the valid demand draft of prescribed application fee has to be sent to "NHTET, Noida" latest by 29 September 2018. The candidates have not to attach another document along with the application form. The candidates will be able to download the admit card from the same portal from 2 to 5 October 2018. The admit cards will not be sent to the candidates separately. The candidates will be allowed to enter the examination hall only with the admit card and original copy of their ID card. NHTET admit card will contain the details regarding the test centre and the address. 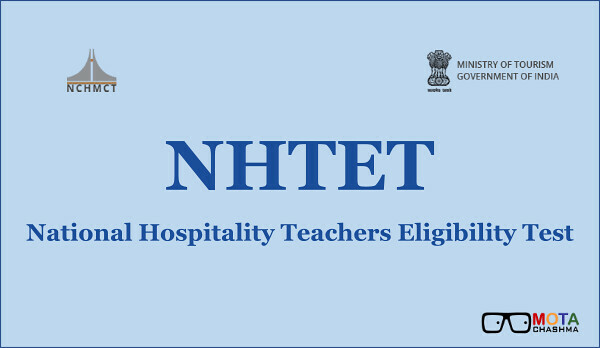 The candidates who have done full-time Bachelor’s Degree in Hotel Management or Hospitality Administration from a recognised University or College or Institute with minimum 60% marks and have minimum 2 years’ experience in the industry after completing the degree are eligible to apply for NHTET 2018. The candidates who have done full-time master’s degree in Hotel Management or Hospitality Administration after the bachelor’s degree in Hotel Management or Hospitality Administration from a recognised University with minimum 60% marks are also eligible to apply. The candidates, who are appearing in the final year examination of their master degree program and have cleared all subjects of previous year/semester, are also eligible to apply. The candidates should be aged maximum 30 years old. The candidates who belong to SC/ST/PD categories will have 5 years relaxation in age and those who belong to OBC category will have 3 years relaxation in age. Candidates must note that the maximum age will be calculated as on 30 April 2018. It will be of general nature, intended to assess the teaching/research aptitude of the candidate. It will primarily be designed to test aptitude towards teaching, reasoning ability, comprehension, divergent thinking and general awareness/ knowledge of the candidate. Fifty (50) multiple choice questions of two marks each will be given, out of which the candidate would be required to answer all fifty (50). In the event of the candidate attempting twice/ thrice, it will be counted as a negative mark. However, there will be no negative mark for the question not attempted. It will consist of 50 multiple choice questions of Nutrition, Food Science, General Management, hotel accounts ( for hospitality related teaching posts ) and Strategic Management, Human Resource Management, Financial Management, Sales and Marketing and Economics ( for management related teaching posts ). Each question will carry two marks. It will consist of 100 multiple choice questions from the four core areas of hospitality i.e. Food Production, F & B Service and Management, Accommodation Operation Management and House Keeping Management. Each question will carry two marks. Before the NHTET Result is announced, candidates can check out the NHTET answer key. The NHTET answer key is released after the exam. The answer key for NHTET 2018 exam on 6 October 2018 will be released by 8 October 2018. A link to download NHTET Answer Key will be available on this page once it is released. Candidates can download the answer key and compare their answers with the answer key. This will let the students get an estimate of the marks that they are going to score in the exam. In case a candidate is not satisfied with the NHTET answer key then s/he can also challenge the answers. To challenge the answers in NHTET Answer Key, the candidate will have to send an email to diraf-nchm@nic.in up to 13 October 2018. Any email sent for challenging the answer key won't be accepted after the mentioned date. The candidates will be eligible for Assistant Lecturer and Teaching Associates in NCHMCT affiliated IHMs on the basis of National Hospitality Teachers Eligibility Test (NHTET) which is going to be held on 6 October 2018. The candidates who clear the written examination, a detailed mark sheet will be sent to such candidates and the mark sheet will remain valid for the time period mentioned on it. List of qualified candidates will also be published on the official website at www.thims.gov.in. Such candidates will be eligible to apply for a post of Assistant Lecturer in NCHM and any of its IHMs. The NHTHT 2018 will be conducted at the given test centres across the country. There is also the list of the affiliated institutes across the country by NCHMCT given below. After the results of the NHTET Exam, the candidates will be considered as Assistant Lecturer and Teaching Associates in NCHMCT affiliated IHMs. There are total 68 institutes affiliated with the NCHMCT 21 Central IHMs, 24 State IHMs, 1 PSU run IHM, 14 Private IHMs, 10 FCIs. A detailed list is provided in the link given below.